When children are young, they use their imagination to come up with adventures at every turn. Rocks and bugs can be their friends just as quickly as a doll or car can. The older they get, the less toys fascinate them because it’s harder to project a personality onto an inanimate object. This creates a gap between children and toys, as it’s a rather one-sided relationship. There are starting to be more and more “smart toys”, but they can’t really keep up with how quickly children learn. It’s no wonder that kids are always after your smartphone or tablet, as it can provide a constant stream of new information. 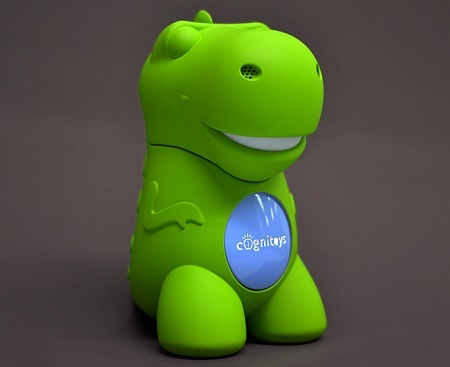 The CogniToys will allow your children to carry on real conversations with their toys after pressing a button on the stomach to start talking, which makes it a truly educational toy. This can listen, speak, and learn with your child to cater more adequately to their needs. It can answer thousands of questions and provide age-appropriate questions, hear and create stories, tell and listen to knock knock jokes, and will make a personality for itself based on how your little one interacts with it. This must be connected to the Internet, so you will need WiFi for it to work properly. It can cover topics such as rhyming, spelling, vocab, math, and more. As your child understands each topic more, the CogniToy will increase the difficulty level. Parents will be able to observe educational progress, and moderate the material. It will cost you $99 towards this successfully funded crowdfunding campaign to be able to receive your own CogniToy.